There are oak trees along one side of the road where I like to take walks in my neighborhood. At the beginning of September, branches filled with leaves begin dropping down onto the road and continue throughout the month. The color of the leaves depends on the time of the season and how long they've laid on the ground. 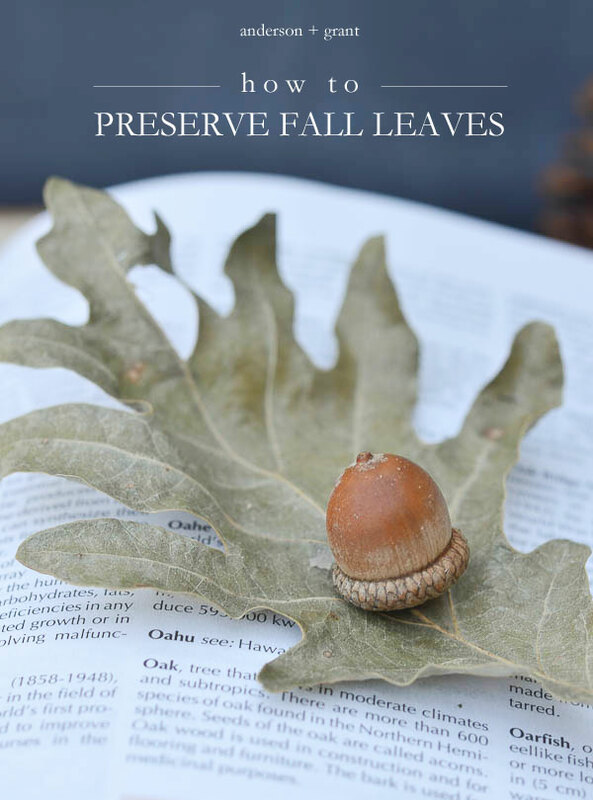 So, here are my four methods for preserving leaves to use year after year. Last year, the leaves were a light green color because they had laid on the road awhile before I collected them. (These were the leaves I used on the preserved leaf tree I posted about last week and my fall mantel.) 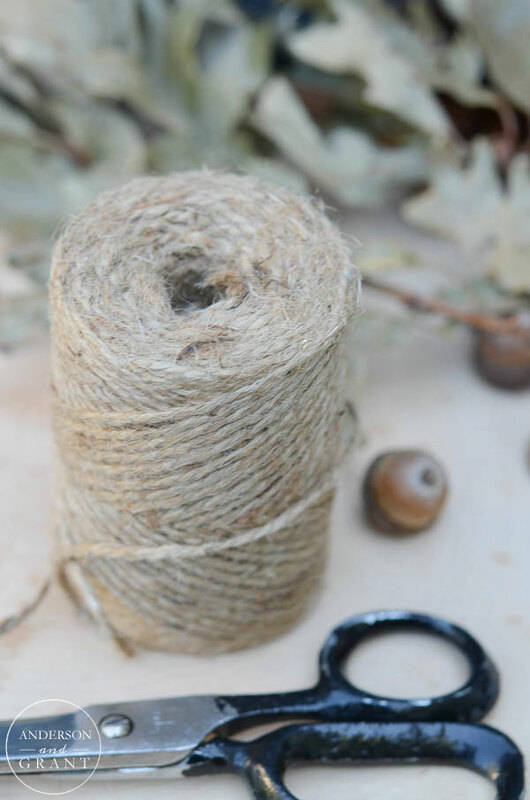 After gathering a bunch of branches, I tied them up in small bundles with twine and hung them for about a week to dry. A year later, and the leaves are still just as beautiful as they were last fall. The part that I didn't like about hanging the branches was that some of the leaves tend to turn around, so when you go to use them in a display sometimes your branch has a bunch of leaves that are backwards. This year I collected some branches with vibrant green leaves. Because I was going away for the weekend and wasn't interested in tying them up, I decided to experiment to fix the problem of the turning leaves. I laid the branches out flat on my dining room table to dry. When I came home after a few days, the leaves were dry and still the same pretty green color. And for the most part, the leaves did not turn around on the branches. Both of these methods will allow for your leaves to curl naturally around the edges, which I find very pretty to see. These leaves were used in places like my fall ironstone cupboard and around my pumpkins from Target. 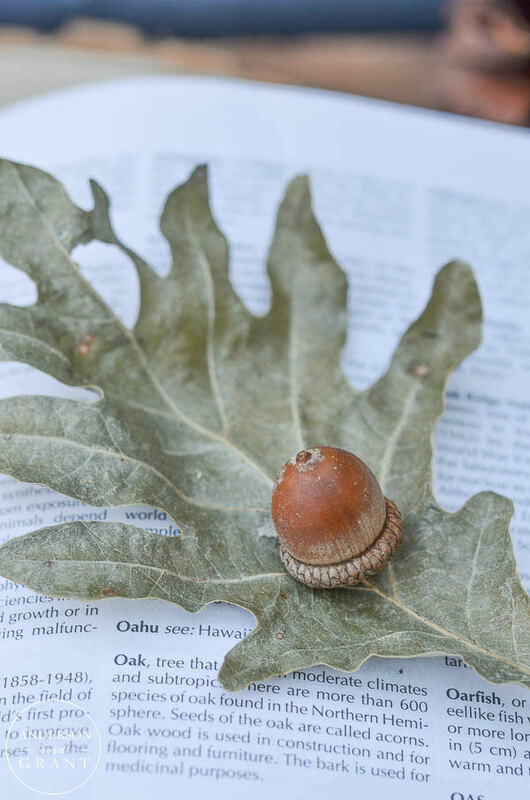 Another way to preserve leaves from year to year is to press them inside of a heavy book (like an encyclopedia or large telephone book). 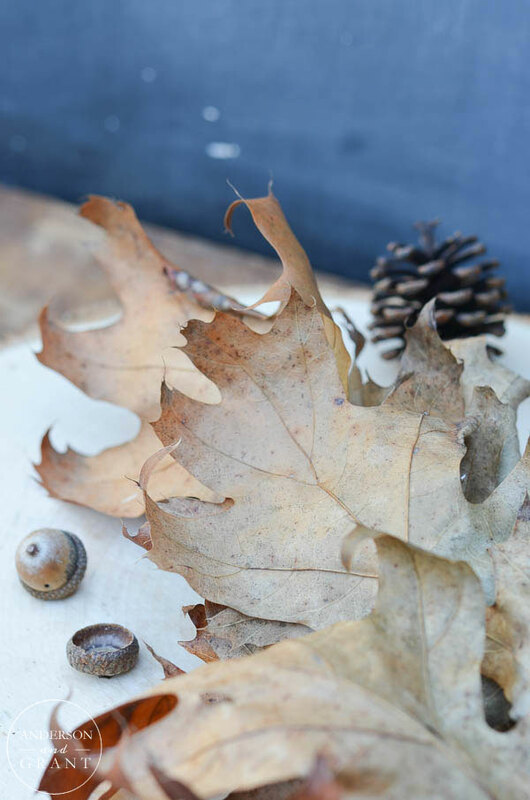 Lay your leaves between two sheets of paper towel to absorb any moisture and place that between a top and bottom layer of waxed paper to protect your book. This will eliminate the curling around the edges and give you a completely flat leaf. 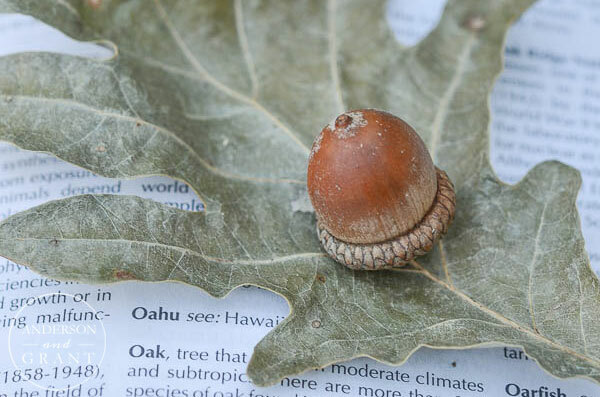 You may be able to do this with a very thin branch of leaves, but normally you'll have to remove the leaves from the branch for this process in order for the book to close over the leaves. This method will give you pretty individual leaves to spread around your decor or use as place cards on your dining room table. 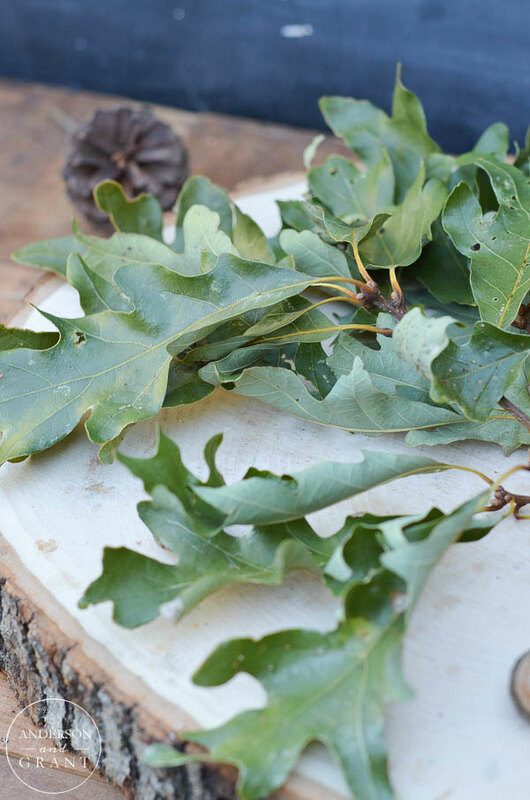 The easiest method of drying and preserving leaves is to let it happen naturally on the tree. I don't know if all trees do this, but my oaks will sometimes have branches of leaves that dry but don't fall off. I had to jump to reach this pretty bunch (and ended up crushing many of the leaves in the process! ), but I wanted to show you how pretty they can become all on their own. This would be a pretty color palette for my decor next year, don't you think? Once your leaves are dry that should last for awhile. They can then be displayed in different ways throughout your house. It is probably a good idea if you are going to use these leaves from year to year to spritz them with water occasionally. It will help maintain their color and keeps the leaves from becoming too brittle. Hopefully this post has answered some of the questions you've had about the process of drying fall leaves. What ways have you tried? I'd love to know what works for you!